Sometime in the early First Era, the Dwarven clan Kragen followed the path of the Rourken clan and migrated west from Morrowind. They settled in the Reach region of Skyrim, founding a city called Arkngthamz. Thanks to the discovery of aetherium deposits, the city flourished, and soon allied with the cities of Bthuand-Zel, Mzulft, and Raldbthar, in an attempt to study the wondrous material. For this purpose, the alliance built the Aetherium Forge beneath the ruin of Bthalft in the Rift. 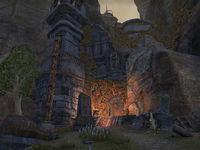 At the peak of Arkngthamz's power, Clan Kragen decided to expand their holdings to the southwest and dug through Dragon's Teeth Mountains, eventually founding a sister city, Arkngthamz-Phng, on the border with Hammerfell. The city grew rapidly, and eventually replaced the original Arkngthamz as the seat of the clan's power. Entrances to the city existed in High Rock and Hammerfell. Eventually, the city was laid to waste by the dragon Thurvokun, and the Dwemer were driven away. The story of a dragon claiming the city as its lair and the "Phng" suffix in the city's name ultimately led to the adoption of the name "Fang Lair". In the late years of the First Era, some time after Emperor Reman stopped making sport of dragons, a group of three adventurers delved into Fang Lair and slew Thurvokun, perishing there in the process. Around 2E 583 the necromancers of the Blackmarrow Cult, led by Orryn the Black, raised the adventurers as undead servants. Orryn managed to briefly reanimate and possess Thurvokun's skeleton, but was defeated by members of the Undaunted, assisted by the freed souls of the three adventurers. In the late Third Era, one of the pieces of the Staff of Chaos was hidden in Fang Lair. After learning the ruin's location from Queen Blubamka of Rihad, the Eternal Champion visited it and retrieved the relic on his quest to defeat Jagar Tharn. This page was last modified on 1 March 2019, at 20:14.